Scientists from Irkutsk National Research Techical Institute Yuriy Davydenko and Denis Bogdanovic presented at the international forum Near Surface Geoscience-2018 the technology for electromagnetic sounding in engineering survey and search of hydrocarbons. At the exhibition stand, the results of two expeditions were presented: shipboard tests of the unified software and hardware complex “MPAC-3D-ELECTRO”. The works were held last summer in the Black Sea in the framework of the MARINET project. The “MPAC-3D-ELECTRO” power source and the measuring station are installed on the ship, and the generator and receiving braids are towed behind the vessel, triggering and recording electromagnetic pulses that transmit information about the structure of the seabed. Such measuring electromagnetic systems have been successfully used for several years by specialists of the Siberian Geophysical Company to search for hydrocarbons on the Russian Arctic shelf. The first experimental work of geophysics carried out this summer near the base of the Institute of Oceanology in Gelendzhik. Scientists conducted the commissioning of the complex and obtained data on its operation in the mobile and static enviroments. Part of the measurements were made in the area of ​​the Blue Bay. The next expedition took place a week before the start of the forum Near Surface Geoscience-2018. The report attracted the attention of colleagues from Iran and the United Arab Emirates, the guests of the forum were interested in the prospects of using the technology for oil and gas exploration. Also, scientists from Irkutsk discussed the possibility of using marine electrical reconnaissance systems to solve problems of engineering geophysics with the director of the research department of the Institute of Advanced Industrial Science and Technology, Yuji Mutsihata (Japan). The subject of the negotiations with Jonathan Rudd (Great Britain, president Dias Geophysical) was the opportunity of joint cooperation in the development of equipment for recording the effects of induced polarization. The conference was held on 9-12 September in Porto (Portugal) under the guidance of the professional Association EAGE. 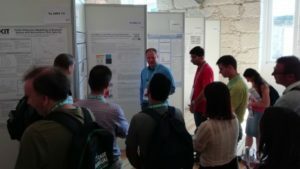 The forum brought together industrialists and scientists from European countries, Australia, Japan, and South Korea, specializing in the performance of near-surface geophysical studies.